Most Fayette County homes have water, sanitary sewer and electric service. Some also have natural gas service or use propane for heating. Unless you live in a rural part of the county and draw water from a well, Kentucky American Water provides your water. Kentucky Utilities or BGE supplies electricity. The city of Lexington provides sanitary sewer service unless your property is connected to a septic system. Columbia Gas supplies natural gas via pipeline to your home or business. Several propane suppliers deliver to homes, farms and businesses. During severe weather or other emergency, you should know how to turn off these services. During periods of extreme cold, water pipes can freeze and burst. If this happens, it’s important to know how to turn off water service to your home, as well as the electric and, if necessary, gas service to the home. Doing this can can keep a bad situation from getting worse. Sewer lines can get clogged and back up. Knowing what to do if this happens can save you time and effort during a cleanup. Remember, regular maintenance of these systems is important. Any heating system should be inspected twice a year. 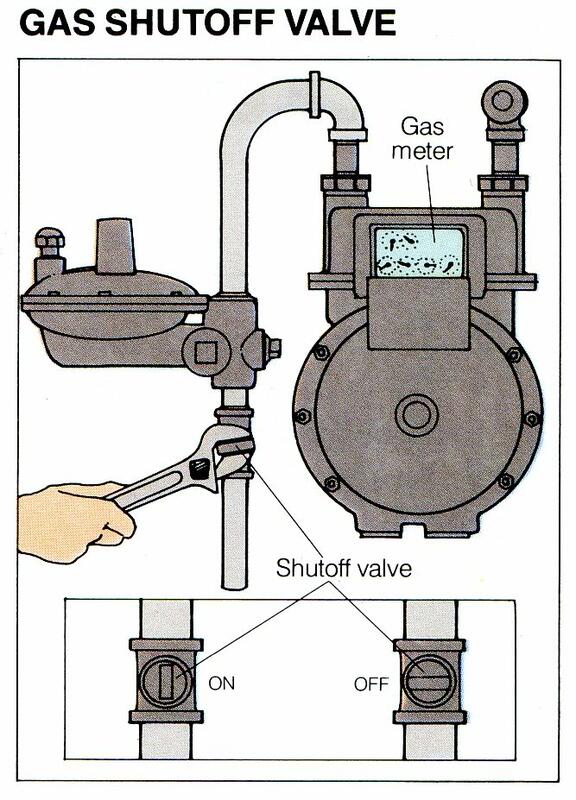 Water and gas cut-off valves should be checked to make sure they can move. If you notice that wastewater is taking a long time drain, it might be time for an inspection to keep an overflow from happening. For many homeowners and business owners, it’s below-zero temperatures that freeze water in the pipes. The pipes crack and break when the ice expands and then leak when the temperatures get above freezing. It’s important that you know where the main cut-off valve is for water service in your home or business. 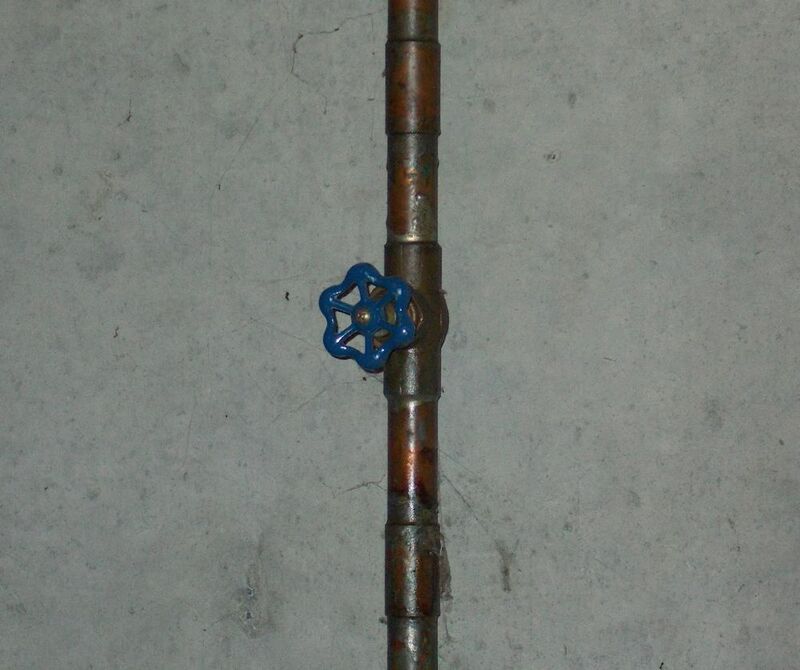 This picture shows a typical cut-off valve. It’s close to where the main water pipe comes into your home or business. Typically it’s in the basement and comes out of the wall or floor. If you don’t have a basement, it will come out of the floor or a wall at the lowest level. It can be in a closet, behind a water heater or access panel. In some homes with attached garages, it can be there. If you have a water leak or a burst pipe, the first thing to do is turn the water off to minimize the damage. To close most valves, turn the handle counter clockwise. Other valves may just have a handle that you turn a half turn to the off position. It’s important to “exercise” this valve every three months. Just make sure you can turn it a full turn. Then open it all the way and back it off a quarter turn. If you don’t exercise this valve every so often, it can “freeze” in place. If this happens and have a water emergency in your home or business, the only way to turn off the water will be from the main shutoff valve in the street. Only a plumber or the water company can do this. Here’s a video that explains how to find the water shutoff valve. Electric service to a home or business starts at one of two places near the building – either from overhead wires or underground supply lines. Overhead supply lines generally run from a wooden pole at the back or front of the building to an attachment point on the building. In some neighborhoods, these service lines run underground to the building. Maintenance of these lines are the responsibility of the utility company. 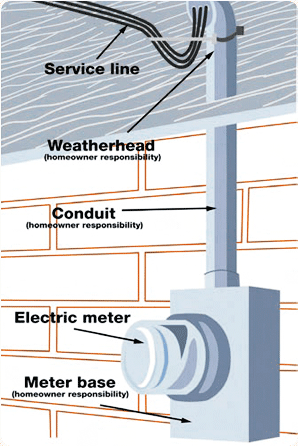 Above ground service lines connect to wires that run to the electric meter through a weatherhead via large metal or plastic conduit. 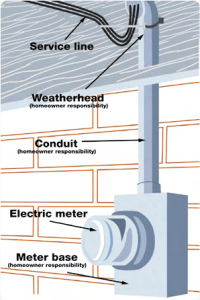 While the electric meter is the property of the utility company, all of the other fixtures are the responsibility of the building/homeowner to maintain. Wires connect the electric meter to the fusebox or circuit breaker panel. Older homes may have electric panels with round screw-in fuses for individual home circuits and larger cartridge fuses for the main electric supply. 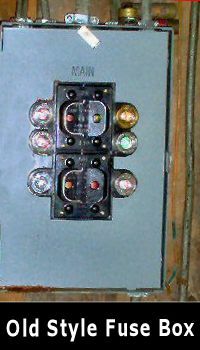 Newer homes have circuit breakers for individual and main circuits. In case of an emergency, such as a frozen or broken water pipe, it may be necessary to shut off electric service to a particular area of a home or business. In severe cases, you may need to disconnect all electric service in the building. To turn off individual circuits, simply unscrew the fuse from the circuit you want to disconnect. Make sure you check and mark individual circuit breakers ahead of time so you know which fuses control which circuits or rooms. To turn off power to the whole house, locate the main panel fuse. On the older panels, it usually has a folded wire handle. To shut off power to the entire house, fold the handle out toward you, grab the handle and pull the fuse holder completely out of the fuse box. Note: Some larger electrical appliances like dryers, stoves and furnaces have similar large block fuses. Make sure you locate and mark the main fuse as well as the fuses to large appliances and systems. 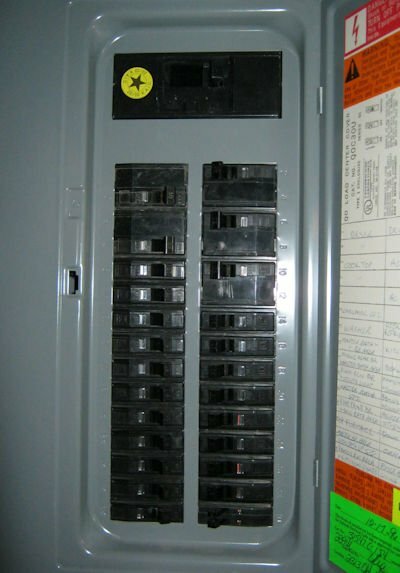 In most homes built after 1970, fuse boxes were replaced with electrical distribution panels that used circuit breakers. These devices sense the amount of electrical current being passed through a circuit. If there’s a “short” or “overload” the breakers “trip” and turn off power to the particular circuit or area of a home or business. Depending on the size of the home, circuit breaker boxes in a home typically contain a main circuit breaker and ten to 20 individual circuit breakers. Again, each circuit breaker should be clearly marked with what device or circuit they control. To turn off power to a particular circuit, locate the circuit breaker for the particular area or device and push it to the “off” position. This is typically the full left position of the breaker switch. To turn off power to the whole house, locate the main breaker and push it to the off position. Typically, this is either all the way left or down. Check ahead of time and clearly mark the OFF position on all circuit breakers. In many homes and businesses, natural gas is used for heating and cooking as well as fireplaces. In certain situations, it can also be used for cooling systems. Columbia Gas of Kentucky is the supplier for most of Lexington. They have great resources on the use of natural gas appliances. If you suspect that there is a natural gas leak in your home or business, LEAVE IMMEDIATELY. Use a cell phone or a neighbor’s phone to call 9-1-1 and then call the Columbia Gas emergency phone number: 1-800-432-9515. Do NOT go back into the home until the fire department and/or representatives of Columbia Gas say it’s ok. Most natural gas service comes into the home or business from an underground gas pipeline than runs from a main line underneath the street in front of the home or business. The line connects to a gas meter and the line then enters the building through the basement or crawl space. The main valve to the home is on the line going into the gas meter. These valves vary in shapes and sizes. 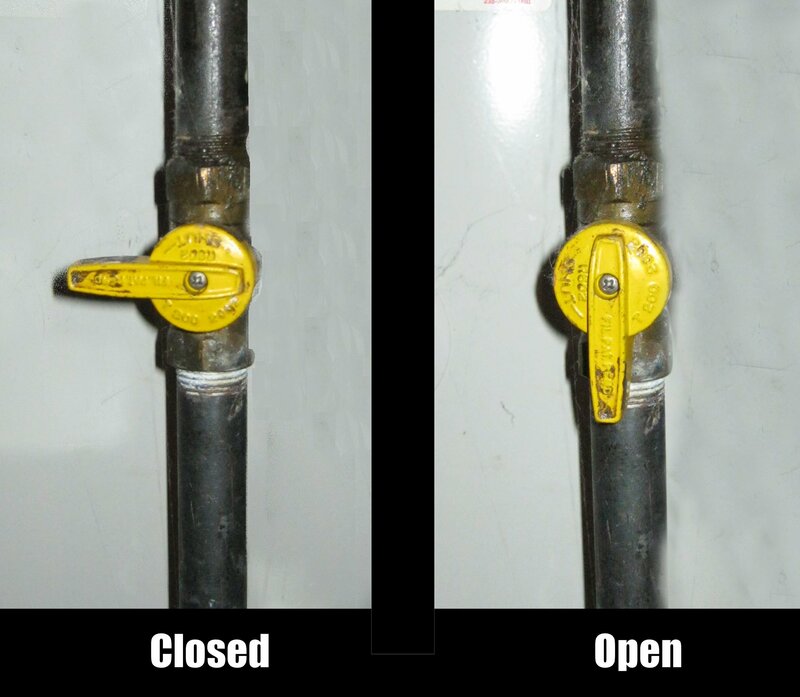 The picture to the right shows what a typical valve looks like when it is open and when it is closed. appliances that use it to heat. Again, in most cases, each appliance or device is connected to the gas line through a shut-off valve. The pictures on the left show how valves usually work. If the long handle of the valve is parallel to the gas line, it means the valve is open and gas is flowing through to the device. If the valve handle is forms a 90 degree angle to the line, it usually means the valve is closed and no gas is passing through the valve to the device. Gas valves come is all shapes and sizes, so it’s important that you are familiar with the ones in your home. Unless you are faced with an emergency and know that you MUST turn off the gas to the entire home, this is best left to the fire department, a licensed plumber or a gas company representative. Note: There are special procedures to follow if for some reason natural gas service to your home has been interrupted or turned off. NEVER TURN THE GAS ON BY YOURSELF – Gas service must be restored by a gas company representative.